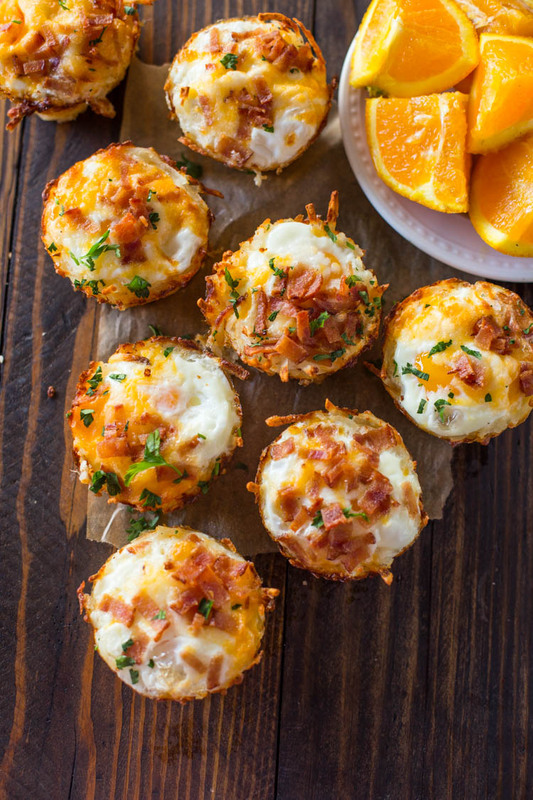 Hash browns packed into muffin tins and filled with egg, cheese, and bacon making perfect crispy nests. They make a great breakfast or brunch and can be frozen for meal prep for a delicious grab and go breakfast. I’m a big fan of breakfast on the go. I can never find a healthy affordable breakfast to go so bagel or scrambled eggs is usually my breakfast on most days. These egg nests are a great alternative to the usual potato and eggs. These hash brown potatoes are tightly packed into muffin tins to make ‘nests’. They are then baked for 20 minutes until crispy. Now here comes the fun part, the eggs, cheese, and bacon is then placed in the egg nest. At this point feel free to let your creativity shine by adding your favorite omelet add-ins. Sometimes I like to add sautéed red bell pepper and onion or mushrooms. Today we are going to simplify this recipe by using Simply Potatoes® hash browns. They work great in these nests because they are made with fresh never frozen potatoes, so no peeling or shredding required! Another hack for simplifying this recipe is by using pre-cooked bacon. I used al fresco chicken bacon because all of the al fresco products have at least 50% less fat than traditional pork and beef products, are 100% all natural and delicious. Plus, there are no artificial ingredients, no preservatives, no nitrates or nitrites, no MSG and gluten free. All al fresco products have 35% less sodium than pork products! 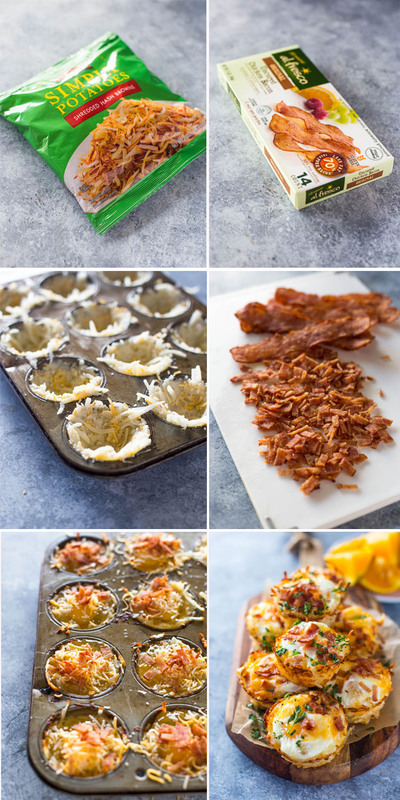 Hash Brown Egg and Bacon Nests + Giveaway! In a large bowl, combine the hash browns, ½ cup cheese, and salt + pepper. Grease a 12 cup muffin tin with cooking spray. Divide the hash brown mixture evenly the muffin cups. Use your fingers to pack them tightly and shape them into nests or press down with a small measuring cup. Crack a small egg into each nest. At this point, add in any additional mix-ins (such as onion, pepper, mushroom, or spinach, optional). Top with a sprinkle of cheese and diced bacon. Bake at 350F until the egg whites set, about, about 12-15 minutes. Cool for 5 minutes before removing from pan. This entry was posted in All, Food, Healthy Meals. Bookmark the permalink.